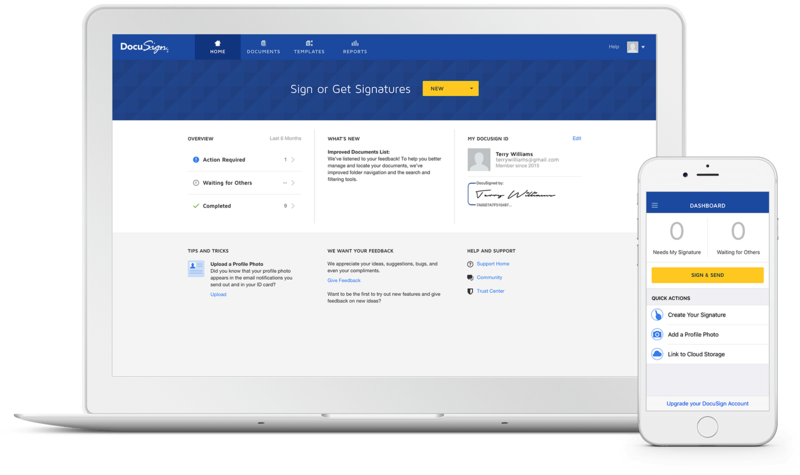 The DocuSign electronic signature app provides consumers and professionals with a simple way to legally sign and return documents from anywhere, anytime, on any device. Documents can be uploaded and sent for others to sign. The app allows users to send reminders and check signing status at any time. Users drag and drop DocuSign tags to indicate where a signature, initial, or date is required, or they can add standard or custom fields to be filled in. DocuSign then emails a link to each recipient to access the document. When they document is complete, it’s stored securely for easy retrieval. DocuSign’s mobile app allows users to get work done without being tied to the office. Users can securely send, sign, and manage business-critical transactions from anywhere. Customers can quickly and easily complete transactions from their smartphone or tablet. DocuSign offers online signature apps native to every major mobile platform. DocuSign offers integration with many programs, including Microsoft, Salesforce, Google, NetSuite, SAP, and Apple. DocuSign also offers a DocuSign Signature Appliance ideal for organizations that need a private or hybrid cloud deployment. Built using industry-standard digital signature technology, the Signature Appliance meets widely accepted electronic signature standards worldwide. The DocuSign Signature Appliance uses the industry-standard Public Key Infrastructure (PKI) digital signature technology. The DocuSign Signature Appliance is a global solution that can be used to meet industry regulations in many regions around the world. Key security certifications include FIPS 140-2 Level 3, FIPS 201 PIV Standard and Common Criteria EAL4+, for compliance with government regulations in North America and the European Union (EU). The DocuSign Signature Appliance integrates with your existing systems, adding electronic signing while letting people continue to use the processes and tools they’ve come to rely on. Users can sign directly from their trusted authoring applications, and the resulting documents stay in their original file formats. Not sure DocuSign is right for your business? Use our e-Signature software Product Selection Tool to compare other e-Signature software solutions. Have questions? Call or email one of our unbiased Technology Advisers for a free consultation. Learn everything you need to know about DocuSign. Our experts will reach out to you shortly.